According to a MeT department official, the minimum temperature fell to 13 degree Celcius, one degree below the season’s average. The weatherman also predicted the rain on November 14 or 15. NEW DELHI: After a relative respite on Saturday, the national capital was again enveloped by a thick blanket of smog on Sunday. MeT officials say high level of humidity – 98 per cent – was a major contributor in the smog's increase. According to a MeT department official, the minimum temperature fell to 13 degree Celcius, one degree below the season’s average. The weatherman also predicted the rain on November 14 or 15 and claimed that it would help clear the smog but could result in its further intensification. 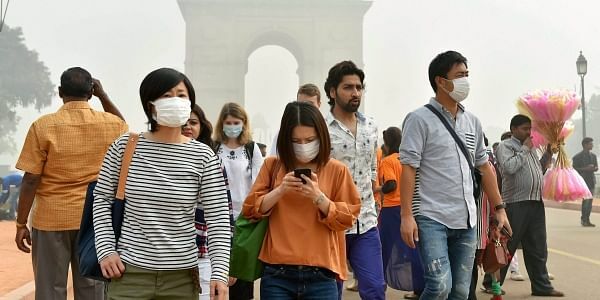 The national capital had been engulfed in a thick blanket of smog on Thursday and Friday which had forced the Delhi government to take emergency measures like shutting schools and banning construction activities. The AAP government had called off the odd-even car rationing scheme after the National Green Tribunal (NGT) rapped it over exemptions. The government, however, may file a review petition with the green court on Monday. Meanwhile, the NGT directed the AAP government and all municipal corporations to discourage roadside parking by ensuring there are enough parking spaces for cars. A bench, headed by NGT chief Justice Swatanter Kumar, rapped the government for not complying with its order to decongest traffic. “Why have you not created appropriate parking place for cars? You people are responsible for creating mess on roads by creating two-three lanes of parking. Why don’t you cancel the agreement with contractors who abuse terms. These parking people become officers and traffic police just watch them,” the bench said. To tackle the problem of pollution, the green court also directed the government and traffic police to issue challans and seize diesel and petrol vehicles which are more than 15 and 10 years old respectively. “We direct the Commissioner of Police, Delhi to ensure that vehicles which are violating the directions of the tribunal should be seized and a compliance report be submitted on the next date of hearing,” the bench said.